MV2400-ST Advance Type M800 is now capable of submerged cutting up to 16.5 inches deep with the full support of the best auto threading system on the market today. With an annealing length of over 21 inches, this system is capable of threading the maximum workpiece height both at the start point and through the gap if needed for a broken wire recovery. 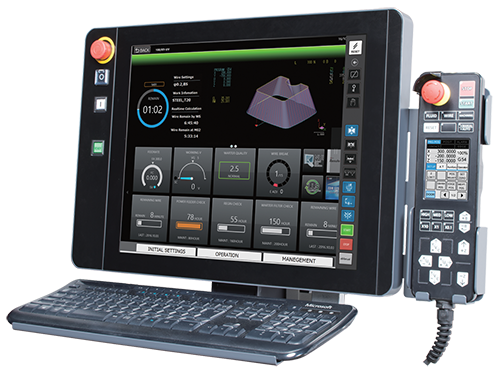 The MV2400-ST Advance Type M800 features the highly reliable non-contact cylindrical drive system and the new Mitsubishi M800 series control with a 19-inch cell phone like touchscreen—providing easier user interface than previous models. With advancements in machine construction and power supply technology, the MV2400-ST Advance Type M800 is sure to revolutionize EDM machining and increase your shop's productivity. New software functions help operators with a setup checklist and enhanced maintenance screens to keep track of operations. All new common shape macros reduce programming time by as much as 88%.